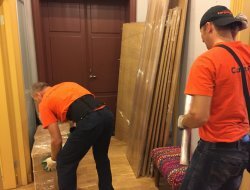 Sometimes moving is accompanied by the process of furniture assembly and disassembly, our employees will dismantle, transport, assemble and put everything back in its proper place without any hassle. The key to a successful move is a qualitative packing, therefore we will choose relevant packing material depending on the surface fragility, value and quality. Moving boxes and boxes for moving.